Business in the front, party on the back, but honestly this dress is all about the party! Ruffles X Stripes X Bows equals perfect summer dress. Wouldn't you agree? Today was 90 degrees in the city, so I was very happy that I decided on this dress in the morning. Light material and open back almost made it bearable to be outside. 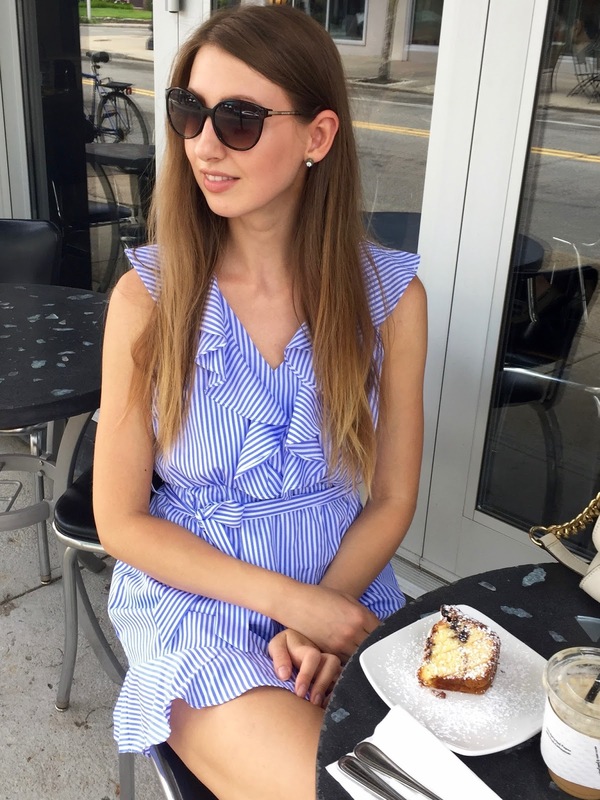 Also white and blue striped clothing turned out to be my jam this summer, so this pretty Ruffle Hem Stripped Belted Dress from Zaful was a love from a first sight. I'm not usually wearing stripes, especially lengthwise, since they make you look taller, and lets just say it's not my prerogative. However this dress has a different effect, because it has ruffles. They give a "volume'' and help shape your figure. I'm very curious to know how do you feel about stripes? Leave your comment below.